Are you tired of shaving or frustrated by those unsightly red bumps you get after shaving? If you answered yes to either one of these questions, then Xanadu Med Spa has the perfect cost-effective hair removal solution for you. Permanent hair removal, also referred to as permanent hair reduction or laser hair removal, is the ideal choice for men or women who are tired of having to shave regularly. Laser hair removal treatments can get rid of unwanted hair on virtually any part of the body, including the face and neck, arms, underarms, back, chest, legs, bikini area, hands and feet. Xanadu Med Spa is committed to the comfort and safety of our clients and is constantly evaluating new technologies in the market. We are proud users of the Cutera excel HR™. Excel HR uses premium laser hair reduction technology for women and men of all skin types. Its technology delivers consistent energy in each pulse reducing the amount of treatments required. We typically recommend six treatments spaced four to eight weeks apart. This is due to the hair growth cycle, which is divided into three phases. 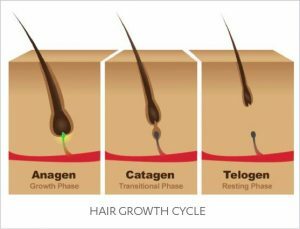 The anagen phase is when a new hair is generated by the follicle and it is at this stage the laser energy will destroy the hair. The anagen phase does not all begin at the same time that is why multiple sessions over different time periods are needed. Excel HR significantly improves client comfort by offering continuous cooling before, during, and after each laser pulse to achieve the safest most effective results for clients of all skin types. Areas that can be treated are legs, bikini area (including Brazilian), underarms, arms, chest, back, abdomen, and face. Will laser treatments damage my skin? With Xanadu Med Spa’s Cutera excel HR™ laser and its sapphire contact cooling technology, there may be some reddening of the skin after a treatment, but it keeps your skin cool while it works. Laser hair removal at Xanadu Med Spa feels like a rubber band snap on your skin, but with our Cutera excel HR™ laser and its sapphire contact cooling technology, your skin stays cool and comfortable throughout your treatment. What kind of lasers does Xanadu Med Spa use? How powerful are they? Xanadu Med Spa uses the Cutera excel HR™ Laser. Cutera’s unique sapphire contact cooling technology keeps your skin cool, which dramatically lowers the risk of injury and pain. You should stop any waxing or tweezing you do six weeks before coming in for your laser hair removal. You can still shave and should shave within 24 hours before your treatment. The hair needs to be in your skin, but not above the skin, for laser removal to work.